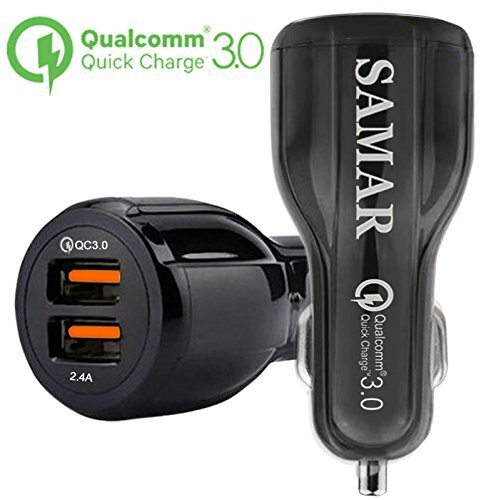 The SAMAR Car Charger charges compatible devices four times faster with Quick Charge 3.0 than another standard charger. Dual USB Port with one Quick Charge 3.0 and other 5V/2.4A. Ultra-Smart and Small, Car charger size is 3.15 inch * 1.3 inch with Smart technology automatically adapts suitable voltage for all devices and maximizes the charging speed. Built-in Safety Protection and it protects your devices against overcharging, excessive current and overheating. Compatible with all devices to charge through dual USB port. Use your existing Charging cables to charge your devices by using SAMAR Car Charger Dual USB Port, including iPhone X, 8, 7, 6 Plus, Samsung Note 8, S8 and other Compatible devices. UNCONDITIONAL 1 Year WARRANTY: SAMAR Retail Packaged Dual USB Car Charger with unconditional 1 Year Warranty and all costs covered during Replacement process. It does what it says ! !